Why do we find ourselves in the position of the gas hostages of Ukraine? 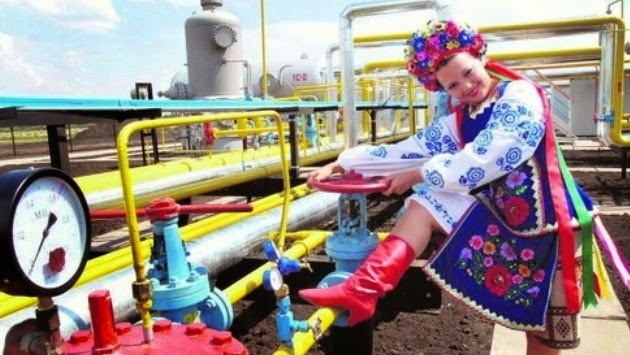 Only a short time ago many of us wandered what will happen in Ukraine, if Russia decides to shut off gas supplies to Europe through the Ukrainian gas transportation system, as in 2009. Mostly now the Ukrainian crisis is presented to Europeans as an outcome of the aggressive policy of Russia. So for us before now, there were more or less sound reasons for considering this further possible turn in gas disputes as an unfriendly action from Russia. But recent events have surpassed my intention to consider how Russia shuts off supplies of the Siberian gas to Europe. Ukraine turned out to be ahead of what I could expect as well as probably many others who with concern and often with a growing disapproval evaluate the situation related to the supply of gas to Europe. Although to be obvious, a new move in the gas disputes was directed by the Atlantic patrons of Ukraine. However, it is not always… Instead of cutting off gas supplies Russia had reacted for Western sanctions and imposed a ban for imports of Finnish and Lithuanian milk, as well as vast majority of other agricultural products from the EU for one year. And after that instead of Russia now Ukraine is declaring its readiness to cut off gas transit! Ukraine's parliament has recently adopted a new law with a package of sanctions that includes about 30 measures. Although the law doesn't mention Russia as its target, the Ukrainian Prime Minister Arseniy Yatsenyuk said earlier it would open the way to impose sanctions against Russia. One of them is intended for legalizing a ban on transit of Russian natural gas and other energy resources through Ukraine territory! It is noteworthy that this law transfers the right to impose sanctions to the Ukraine's National Security and Defense Council as if the Board of Ministers of Ukraine would not to be willing itself to take a full responsibility for consequences of its future application. Now, Ladies and Gentlemen, please feel yourselves comfortable near your computers and tablets and prepare for the news that you are being threatened with blackmail and that it will be a racketeering activity of the Ukrainian authorities! Assuming that your attention to the political crisis in Ukraine and a related war of economic sanctions against Russia largely (sorry for my cynical viewpoint) has been associated with your curiosity as of a detached observer. But now everything has changed dramatically because that the present action of the Ukrainian authorities obviously poses a direct threat to our well-being. So far, our politicians have argued about a potential threat of stopping supplies on Russia's initiative, reasoning in this regard that it proves a vital need to reduce as soon as possible "dependence on Russian gas." Although I already mentioned previously that Russian share in an annual gas imports to EU actually is not higher than Norwegian. But as a matter of fact it turns out that now there is a necessity urgently to discuss the problem of how to reduce dependence on a transit monopolist that is Ukraine. Because in accordance with contractual obligations Ukraine has to provide transportation through its territory of more than 60% of Russian gas supplied to Europe. So ultimately Ukraine does not care of losing confidence of international business that, as a common rule, should be the most important attribute of any country. Moreover, the Ukrainian government recognized the fact that shutting off Russian gas transit to Europe would result in a huge loss of about three billion dollars which Ukraine annually earns on providing gas transmission services. However, Mr. Yatsenyuk is quoted as saying that by such a way Ukraine is going to bring to an end gas dependency from Russia. At the same time, he noted that Ukraine expects that financial aid will be granted by international financial institutions, including the World Bank. Here I would like to remind you that the full name of the World Bank - the International Bank for Reconstruction and Development. For most of us it is very questionable whether this respected international organization established in order to promote global development, would compensate the huge losses caused by conflicting actions of the Ukrainian authorities, thereby recognizing and by certain way encouraging this attempt of Ukrainian state racketeering aimed at Europe. Ukraine is eager for depriving Russia of income on gas exports but at the same time as a result Ukraine will block gas supplies to consumers in Austria and in all the countries of South and South-East Europe. That looks like a double strike, is not it? At the moment I would rather not to sink further into geography of deliveries, let's consider later on how it reflects primary reasons of gas confrontation. It's time to remind ourselves that ultimately it is no matter at all what kind of glasses "men in black" wear and what kind of "flashlights" are in use for promoting a contradictory information. Anyway, it is impossible to ignore the fact that since 2008 after signing the relevant international agreements, for six years Russia has been implementing an ambitious in terms of international scope and a technologically advanced gas pipeline project South Stream, bypassing the Ukrainian gas transport system in order to secure a number of European countries from newly appeared Ukrainian gas blackmailers. It would look as if nobody realizes in Ukraine that they are going to block gas to Europe, and what the implications will be for Europe. Even though Mr. Yatsenyuk is quoted as saying "We understand the price should been paid by Ukraine (but it is not only those 3 billion USD - Ed.). But we are willing to pay for their independence". Here you are, there are reasonable questions then. What about us, Europeans? Are we, European citizens willing to continue further to pay for the independence of Ukraine? And what do we expect to get in return? Answer with grim humor might be that in upcoming winter it would not be possible to get anything instead of gas from half-collapsed and half-plundered Ukraine, even neither gorilka nor salt pork which according to their habits could facilitate our stay in unheated homes. And before the winter comes, field rations of NATO soldiers sent together with humanitarian aid to Ukraine will be on the wane. Not long ago in June in Brussels, the Ukrainian heads and leadership of 28 European countries signed the Association Agreement between Ukraine and the European Union. Under the Agreement, Ukraine should move along the path of deepening political, economic and trade relations with the EU Member States as well as develop cooperation in the fields of justice and security. Two months ago, many of us still were sure that Ukraine really want to be a partner of the EU. However, now our expectations have vanished. Whether is it possible to consider partnership in case, when, instead of efforts for promoting cooperation Ukraine deliberately jeopardizes an energy security of its strategic partner? There is another strange assumption that by imposing anti-Russian sanctions Ukraine is trying to support the policy of prohibitions against Russia carried out by the EU and Western allies. But it seems that taking part in this political game on the EU side, Ukraine scores a goal against their own — not the opposing — team, in other words plays against our Western European team. Meanwhile, it is not unlikely that Ukrainian politicians allegedly act in favor of our Western European team, but, in fact, they perform what suggested from behind the Atlantic, as it happened more than once. Moreover, shutdown of transit pipelines obviously would create not less favorable impacts than new problems. So, for instance, it is hardly possible for Europe to get penalties for the gas contracts infringement from Russia in case of violating gas supply, since such disruptions must be classified as results of force majeure. At the same time such a threatening precedent would raise the conclusion that there is a vital need in seeking gas detours around both technically and also politically unreliable Ukraine. In this context, it is even more convincing what Russia is making now a significant positive input into the problem of diversification of gas supplies by increasing up to a full capacity of the Nord Stream gas pipeline and by constructing a new South Stream gas pipeline. Besides another consequence of switching gas supplies from Russia to Europe at new directions a commercial value of the Ukrainian GTS estimated by Ukrainians to 25-35 billion USD, will fall by half. Therefore, open questions with a multi-billion-Euro cost for all taxpayers. How will Ukraine and EU together with the Atlantic allies raise such large financial resources? What countries, what international financial institutions, and of the topmost importance - at whose expense are they going to reimburse a collapse of the Ukrainian GTS and everything else? In summary, it remains to say that despite all the political turmoil, Ukraine obviously has to solve gas disputes with Russia on a mutually acceptable basis not using GTS as a monopoly tool for suppressing consumers of transit services both in the West and in the East. Ukraine will face huge challenges painstakingly seeking reasonable ways of modernizing its gas transport system. It will take years and for all that time ultimately European consumers should mostly rely on gas supplies from existing proven suppliers, including Russia too and Russian pipelines - so-called Streams from the north and from the south bypassing Ukraine with its long-running political, economic and technical problems. And then, in some years, when at last a stable recovery and expected growth of the European economy will require new gas resources, we all look forward to the long-term results of implementation of the European Commission strategy for expanding the sources of energy supply. Why Ukraine attempts to put us into a corner as gas hostages?